I liked the sound of this recipe, as it was fresh and light, used ingredients that I already had and sounded delicious and filling. I also thought it would be great the next day for lunch. It was quite time consuming grilling the vegetables, as I only have a small grill pan. I think next time I’ll cook them on the bbq. 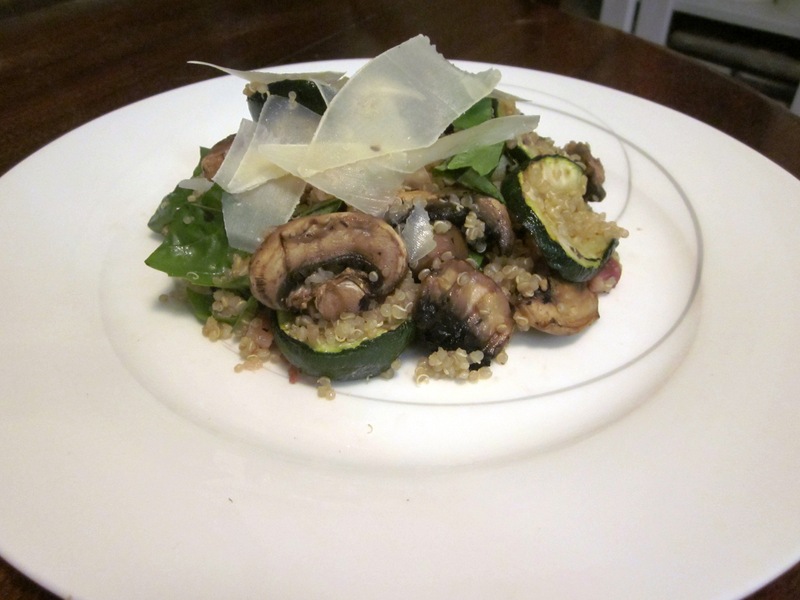 But the result was flavourful and filling, with the chilli adding a hint of heat, freshness from the basil and zucchini, saltiness from the pancetta and the wonderful earthy mushrooms and nutty quinoa. For a vegetarian option, just leave out the pancetta. It was great the next day cold as well. Yum. Today is Good Friday, which traditionally means fish for dinner. And so that is what we had tonight. Friday, as I understand it (and I am certainly no expert) has historically been a day of fasting/abstinence in Christian faiths. For many though in current times, Good Friday is the only day the tradition is observed. After making hot cross buns earlier in the day (recipe to come shortly), I was very glad that I had already planned on this quick and easy dish, with the added advantage of being quite a healthy one too. Which, seeing as I had to sample a few of the hot cross buns to make sure they were good, was just as well. The whole dish took no more than 10-15 minutes to prepare and cook, making it a great week-night meal. 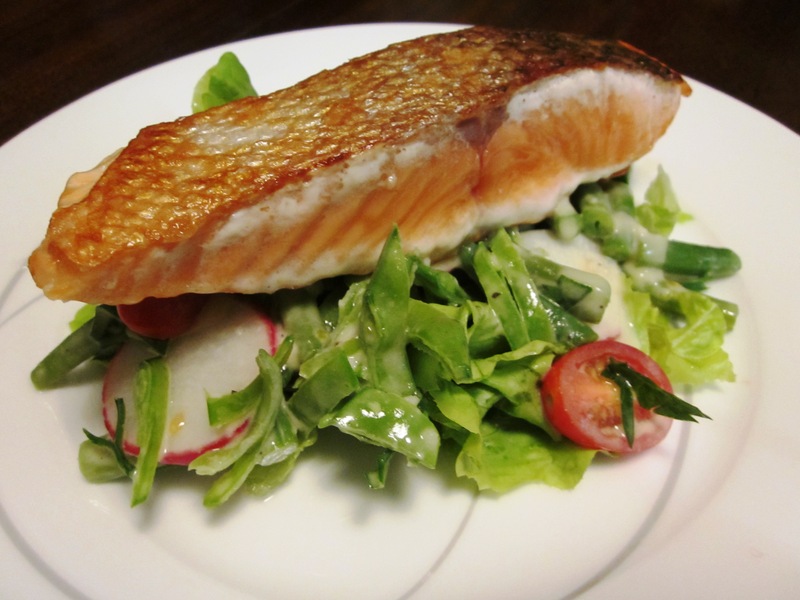 The crisp and fresh salad, creamy tahini dressing (without any cream), lovely tartness from the apple cider vinegar and slight sweetness from the honey all complimented the salmon and each other perfectly. Healthy and tasty, yum. I had a good time on my holidays and I ate a lot of really great food. However, after all that eating out, it definitely felt like time for some healthier home cooking. This recipe is adapted from a recipe I saw a few years ago on an Australian TV show called Good Chef Bad Chef. The format of the show has a normal chef, who cooks rich food that isn’t always good for you and a nutritionist who cooks healthier dishes, cooking different dishes based on the same theme. This dish is adapted from Good Chef Janella Purcell’s recipe. I’ve changed it slightly, using some different vegetables, extra beans to make it stretch further and goat cheese both for its creamy taste and to make it more filling. I also sometimes like to vary the dressing and have included both the dressings I use. You can use whatever vegetables you like really. The recipe is really just an idea that you can adapt to your preferences or what is available. Other vegetables I have used besides those I have listed in the recipe include baby beetroot, leek and baby spinach (added at the end). The leftovers are also great cold as a salad or wrap filling for lunch the next day. This week seems to be the week of recipes inspired by other blogs. After trying a new recipe for the guilt free banana bread, I felt like going back to an old favourite for dinner Sunday night. I’ve also been asked by a friend to put this one up. Given it is a favourite of mine, I didn’t mind fulfilling the request. 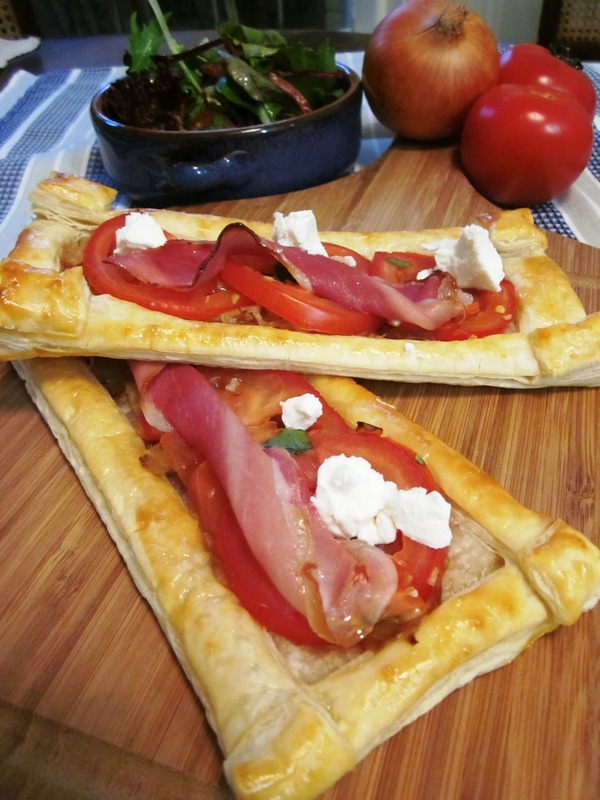 I came across this recipe a year ago at Delicieux, an Australian vegetarian blog. Although not vegetarian myself, I do like cooking vegetarian dishes (I know that hasn’t been reflected in my blog yet…but I’ll get there) and I often find myself ordering a vegetarian dish at restaurants. I find more and more these days that the vegetarian options just seem so much more creative and interesting when I read them on the menu. For this dish I’ve added prosciutto and goats cheese resulting in a non-vegetarian version, but it’s just as nice without the prosciutto. I find I always have extra of the marinated tomatoes mix left whenever I make this. Rather than use less tomatoes, I like to add a couple of tablespoons of balsamic vinegar and extra virgin olive oil to the remaining tomatoes and their juices, and use this as the dressing (with the tomatoes) for the salad greens. I usually get enough for six tarts from 4 large onions (although I used one less onion this time and still made the 6 tarts, so there wasn’t as much onion as usual – hence the gaps in the picture). You could also make these into smaller squares for a nice entrée or canapé. Even though I enjoy cooking, sometimes after a busy day at work, it can be too easy or tempting to succumb to picking up takeaway on the way home. Especially as I have so many great restaurants (Indian, Italian, Japanese and many more) within five minutes of my house. Alternately, I fall back on a few tried and tested favourite recipes, which if cooked too often will no longer be favourites. So finding new quick and easy recipes that I can add to my repertoire and save the takeaway for an occasional treat is something I am actively trying to do. The other day I was looking through a new cooking magazine and I came across a warm beef and salsa verde salad that sparked my interest. It looked like a great spring dinner, but although I liked the look of it and the idea, I didn’t feel like beef so I went with lamb instead. 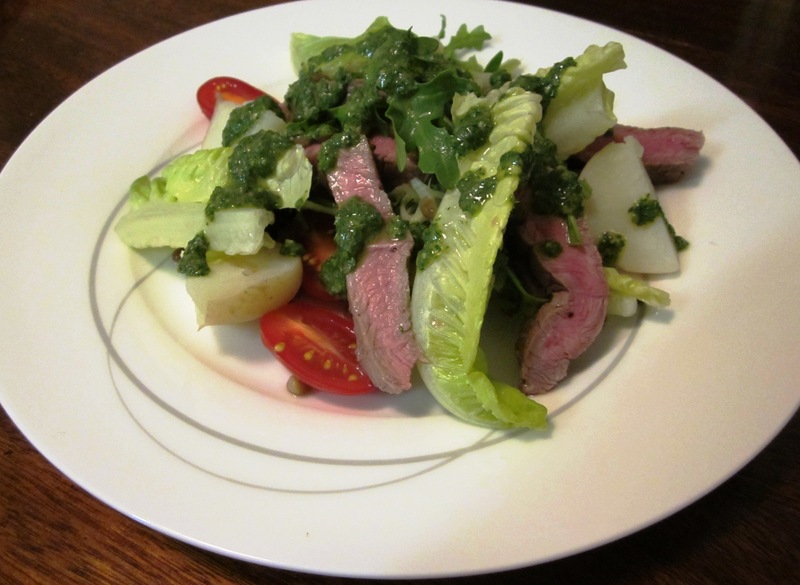 Then because I was cooking with lamb, I thought mint would be a great addition to the salsa verde rather than just the parsley they used. And how about some basil as well given I’m adding tomatoes to the salad, and some lemon to freshen it up? Next thing you know the recipe below was created and the result delivered was just what I was after. A quick (all up around 30 minutes), light and tasty dinner perfect, in my opinion, for a spring night in Perth. Next time I might try cooking the lamb on the bbq instead of the stove. It’s nice when cooking ‘experiments’ work out. And as I’d never used anchovies or capers in any of my cooking before, this really was an experiment for me. Don’t be scared of the anchovies, they don’t make the dish taste of fish. The leftovers were great for lunch the next day, the flavours had intensified and I thought it was delicious.